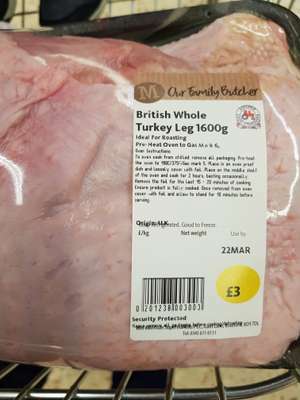 Turkey whole leg cut in half in average 1.5-1.6kg at Morrison's. Currently in Northampton store full stock. Also available in Brentford morrisons too. Not for this size it's not. Good value, cheap meat for a curry. We're near neighbours, might check the one on Butterfly Walk to see if they have any in stock, thought can't stand any of the local Morrison's. £3 pull the other one! Excellent. Bought two packs. Boned, rolled and stuffed the thighs and will use the legs in the pressure cooker. If you do that it all falls away from the tendonds and ends up liked 'pulled' turkey, and you're left with a really wonderful broth to use for gravy. But they almost never have the turkey breasts or crowns, where do they go ........? Which Northampton store is this? As there are two - one on Kettering Road, the other in the town centre. This is available at other stores too so it is "nationwide". I think the person who commented that they are always this price is, probably, technically correct. The product when it is at £4.72 is on a different barcode, so that is technically a different product (even if it is of identical name and description). This £3 version has the price within its barcode, so it is "always" £3. I think the product, in effect, is £3 whilst stocks last. The £3 version comes into stores once they 'start' another £3 offer session and individual stock of it remains until sold - or until it reaches its use-by date and is then discounted. The £4.72 version in future weeks could be found back at other Morrisons stores where £3 stock has apparently sold out, even at times at which £3 stock is still available in another Morrisons. So, even if the £4.72 version becomes the only one available to someone then, the product at £3 could still be found elsewhere and can't be ruled out that it is not always available at £3 somewhere in the country as it then appears to move around from store to store. For all I know, it could be continuously available at £3 somewhere (not the same place, I mean disappears from a place after a week, only then to be somewhere else, then disappears from there and is somewhere else - so, always available at £3 somewhere in the country - however, we seem to have settled on the £3 offer version coming 'back' (if indeed it has and has not been constantly touring somewhere) to Morrisons around now - and it'll remain whilst stocks, which may be replaced, last at each store). The two products, the one at £3 and the one at £4.72, never change in price - it just depends which are available in your Morrisons at any one time. I suspect £3 version may have been unavailable for a few months, during which "everyone" had £4.72, although I never can say that Morrisons does not always have everything somewhere. When they have it at the ones near me it is £3 also. Damn decent deal for the size of of it and have much meat you get. With the boneless turkey I got creative - I unrolled it, filled it with dry couscous, rolled it up and applied mayonnaise all over. Cover with foil and cook in oven - super moist and delicious! I also notice the price fluctuates with the trays of boneless turkey - …I also notice the price fluctuates with the trays of boneless turkey - sometimes something like £5.99 or £7.49. Both a good deal, as it's 100% edible meat, but, strange how the price can be inconsistent (I did notice one time when it was the high of the two they had used a beef description label(! )With the boneless turkey I got creative - I unrolled it, filled it with dry couscous, rolled it up and applied mayonnaise all over. Cover with foil and cook in oven - super moist and delicious! Deal posting newbie! This is Ap0100L first deal post. Help out by leaving a posting tip or just to show your appreciation for their contribution.